Jennifer Webb-McRae always knew what she wanted to be when she grew up. "I knew I wanted to be a lawyer because my family kind of put that notion in my head. They used to tease me and say I argued every point no matter what we talked about," she says. But neither Webb-McRae, nor her family, knew how far she would go -- all in her home state of New Jersey. Jennifer Webb-McRae is the Chief Law Enforcement Officer for the county of Cumberland. 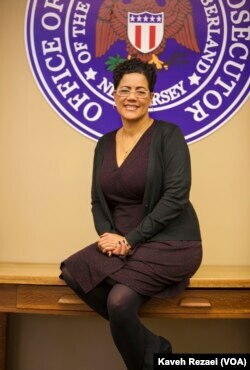 Not only is Jennifer one of a two dozen county prosecutors throughout the state, she is the first African American and first female prosecutor of Cumberland County. Webb-McRae was raised in Vineland, New Jersey. She received her law degree just 40 minutes away from home, from Camden School of Law at Rutgers University in New Jersey. Early on, Jennifer Webb-McRae was interested in family law. She clerked for a judge involved in that field. He became a lifelong mentor. However, she found she had a passion for criminal law when she worked with the juvenile justice system. “I was fortunate enough to get a job very quickly at the Office of the Public Defender representing juvenile defendants. So it was interesting because it gave me a passion for criminal justice, but it also kind of suited that social work element of me to want to do justice and help serve the whole person and kind of started me on my way in the criminal justice world,” she says. Webb-McRae says her responsibilities as Chief Prosecutor of Cumberland County are complex. “There are a lot of hard issues that you face when you have to make decisions that affect people’s lives in the criminal justice system," she says. Some of those issues are mass incarceration and a lack of public confidence in law enforcement. Sometimes the challenges might feel personal. "Being a mother of an African-American boy, to reconcile that I have a role to play in this system and how to do that responsibly," she says. However, Jennifer Webb-McRae knows that her primary responsibility is to prosecute people who break the law in Cumberland County as well as protect the citizens of this great county. Jennifer Webb-McRae also works to help people make good choices, especially young people. She recognizes the power of peer pressure that children face. She notes the strong “no-snitching” culture among young people that can block needed intervention. To battle this, Webb-McRae launched an Annual Back to School Initiative. After just six years in existence, the program now involves 40 schools. Jennifer Webb-McRae and her office staff attend over 30 back-to-school events each year. They share information about programs that help keep kids safe. Prosecutor Webb-McRae hopes her example and career choice will inspire girls in Cumberland County. “I’m passionate about what I do. I’m proud to be career woman. I’m proud to be a role model for other young women who are embarking to be decision makers and I'm passionate about doing justice every day,” she adds. Jennifer Webb-McRae plans to continue to grow in her career. She hopes to become a judge someday. Her belief in community involvement, public service and justice will continue.